Atlas Vanek put the team on his back for most of the season. He and Ryan Miller performed at a high level for most of the year – although Miller’s numbers reflect that of a more average goaltender. Vanek’s contributions are more visible and he is certainly deserving of recognition on a team that would be dreadful offensively without his skillset. Here’s hoping he isn’t traded. Just a dismal year for #21. Stafford could never get the train on the tracks and has been largely invisible on many nights. He wears a letter to boot. To think that he makes $4 million a year is a cap crushing nightmare. I would assume he gets traded in the offseason, but that is no guarantee. Afinogenov is just visible behind Rene Robert. A fairly innocuous observation between Eric and myself on the last Instigator Podcast has suddenly become a big story in hockey circles. Maybe if there was hockey being played this wouldn’t even matter. But since this ridiculous lockout continues, Max Afinogenov’s inclusion on the Alumni Plaza mural is a story.To offer a recap, Afinogenov was included on a photo mural of former Sabres that adorns the walkway in the newly anointed Alumni Plaza. 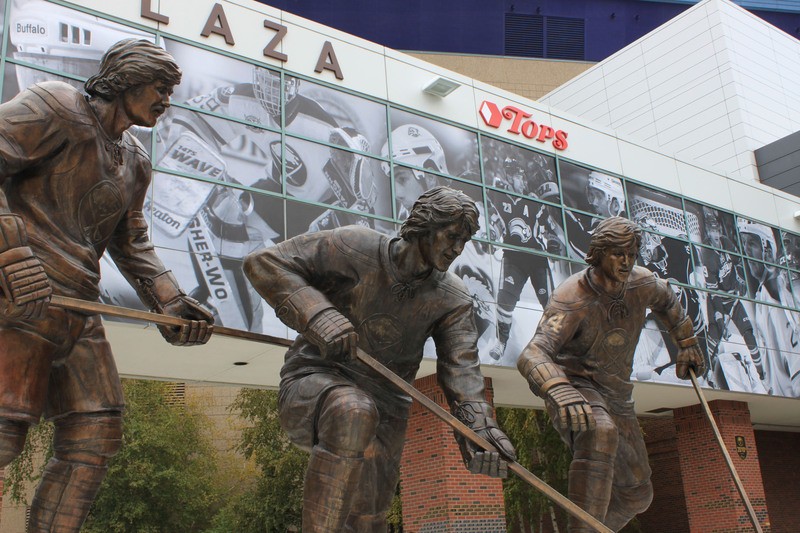 The decision to cover the walkway with former Sabres was not only a decision likely forced by the lockout (and inability to use current players for promotions) and the convenient fact that the creation of the Plaza would make the black and white headshot mural quite out of place. For what it’s worth, the team picture mural concept was getting old fast and I commend the Sabres for having a new option that they can renew each season, if they so choose. This is old news, I know. But I did manage to meander my way down to the Sabres Alumni Plaza the day after the French Connection Statue was unveiled. The official unveiling was on the 12th and I managed to spend some time down near the arena (and Canalside) on Saturday the 13th. While this post is a bit tardy, it doesn’t make the plaza any less striking. While the photo of the French Connection used in numerous locations (including beer paraphernalia) seemed to be a better picture of the group to use, the interpretation of the photo and the way the statue plays the scene is terrific. 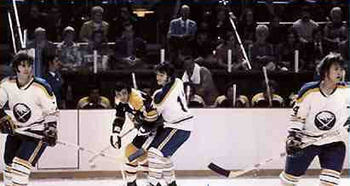 The action of Perreault and Robert reaching for the puck gives the ability to view the statue from a number of different angles. The Alumni Plaza as a whole is somewhat underwhelming at this point just because the player and fan bricks are very much an ancillary addition. There isn’t much to the bricks unless you’re looking for a specific player or your individual brick. Ultimately the bricks will be a very nice addition to the entire atmosphere of that plaza, but as of now they are sort of just there. One thing that a few people have brought up is the fact that they’re eventually going to run out of room on those pillars. Now, that won’t be a factor for a number of years. But there are no more pillars to utilize beyond the one pegged for the 2010’s. Perhaps the 70s era players should remain on the first pillar with the remaining ones used to mix in the rest of the players from the 80s, 90s and 2000s. At least that would allow for more flexibility as more and more players make their debuts. That point is quite minute and truly won’t be an issue for at least another 10 years based on the number of players who will be making their debut. Worst case scenario is that the 2010’s column needs to be given a different distinction and becomes far more populated than the rest. For me, the exciting part is what will come next. There is a ton of space in the plaza and there will be plenty of room to create a monument park with a number of different statues mixed in. Between previous posts and passing comments between Eric and myself in the Instigator Podcast, the full roster of future statues has probably been laid out. Hasek is the most obvious next choice with Tim Horton being a close second or in a dead heat with the goaltender. Danny Gare and Pat LaFontaine would be fine additions too (as each retired number should get equal treatment). I love the idea of honoring the Knox Family along with the obvious need for statues honoring Ted Darling and RJ as well. It is fairly obvious that Terry Pegula and Ted Black don’t just want to create avenues for additional fan involvement but that they strive to create unique and outstanding additions to FNC. To say I have the utmost faith that they will succeed with turning the Alumni Plaza into an unforgettable addition is an understatement. Now the only thing left is to wait and see when another statue will be placed on the site. The lockout is indeed on. While the CBA arguments went beyond the September 15 deadline, regular season games have now been cancelled and this has become a very real thing. Eric and I sat down to discuss the lockout, solutions for it and a host of other topics. We tackle the Alumni Plaza and, of course, play a little plus/minus.